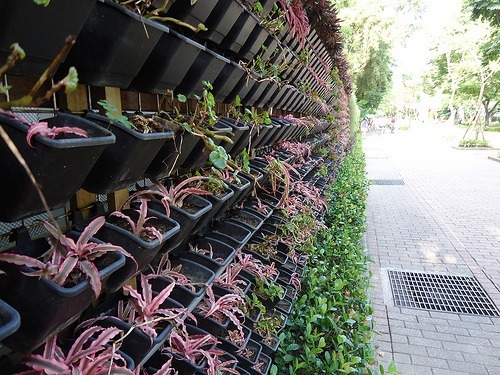 Vertical gardens are en vogue due their beauty and environmental benefits. The beautiful one above lives at SDGE’s Energy Innovation Center where residents and guests come to view green building practices and learn about smart energy initiatives. We’ll also walk you through why you may want to consider a vertical garden, common ways to plant one, potential issues, as well as planting ideas to consider. Why Build a Vertical Garden? A vertical garden can utilize an otherwise empty space while softening up surrounding architectural elements. Big cities are implementing the technique for this reason, but also in an effort to help clean the air. Not to mention, these gardens are pretty to look at and serve as subtle reminders of environmental issues to passers-by. 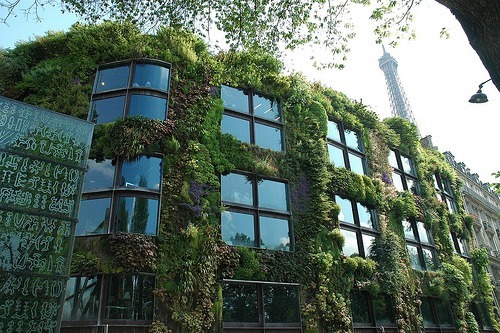 You’d probably stop to admire this one on Musée du quai Branly while wandering the streets of Paris, wouldn’t you? Roof gardens are also becoming opportunities for hotels and restaurants to grow their own vegetables and herbs on property, giving a whole new meaning to locally-sourced while also improving urban air quality. Roof gardens also can absorb the majority of rainfall, eliminating unnecessary run-off into storm drains. If attached to buildings, both roof gardens and vertical gardens also provide insulation, potentially reducing indoor heating and air costs. The biggest concern for homeowners is usually how they’ll water a vertical garden without making a complete mess on the patio or inside the home. Most smaller installations have a system of top-down watering meaning that by using a watering can or hose at the top, water drips to the bottom nourishing roots along the way. The problem is that plants at the top might receive too much water while plants at the bottom might not receive any at all. Most experts will tell you that failed watering techniques are often why vertical gardens don’t survive, voiding the idea of sustainability to begin with. Homeowners lacking green thumbs or patience can buy vertical garden systems that involve pumps, sensors and timers in order to take the guesswork out of watering, like this popular (though pricey) model from Plants on Walls. Or, try these recycled bottle planters by Wooly Pockets that don’t leak water and can be used with a drip irrigation kit. There are a number of ways to install a vertical garden both indoors and outdoors with companies manufacturing special trays and contraptions depending on your desired result. Keep in mind that the structure should be able to allow air to circulate over or through the wall. We’re mentioning the most common structures used. Have power tools in the garage and a love of DIY? Watch this video by Home Depot demonstrating how to build your own vertical garden using pressure-treated wood. Even if you have no intention of doing this, the video shows important components of vertical gardens including how they prevent dirt from falling out. 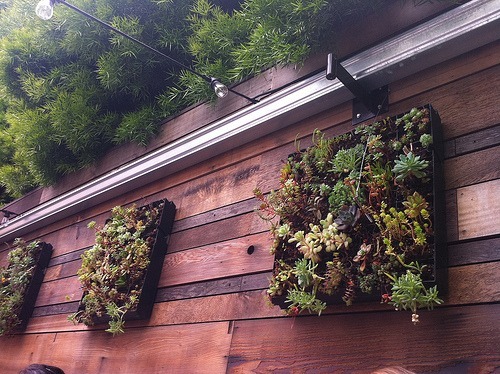 Probably the most common method of vertical garden installation on a small scale is by a tray that attaches to the wall. Most living wall trays have segmented grids or pockets. For example a 20″ x 20″ wall tray may be divided into 45 smaller pockets that allow dirt to be easily contained and easy planting. As mentioned above, smaller wall trays usually are irrigated by using a watering can or hose and allow water to drip down into each tray unless you go for a more sophisticated set up. Attach planters to the wall in an upright manner by using wood planks attached to the wall or nailing them to a wooden fence. This way, plants grow upright like usual and you could create stunning arrangements in each planter by combining different colors and textures. The sky is the limit when it comes to what kind of material to use as the planter for your vertical garden. Just make sure that you have a waterproof backing that won’t damage the wall it’s hung on, if that is a concern to you. 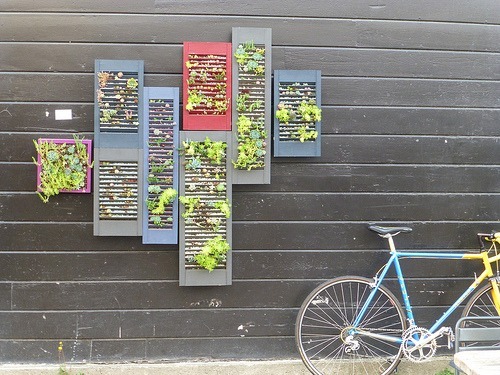 This clever gardener re-purposed window shutters to create an artistic vertical garden. Take advantage of the space between the slats. Fill them with dirt and plant what you wish. 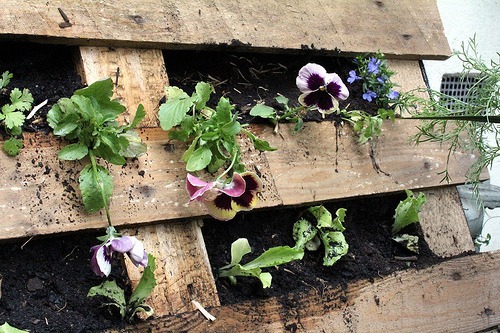 Or, hang the wood pallet on the wall and attach (clip or nail) planters to it in an upright manner. There maybe existing spots in your yard begging for planting, such as separation between rocks. Why not slip in a few plants? Consider the amount of sun and the climate you live in while using plants that require more or less the same amount of water. Popular vertical garden choices include the following (though some will require professional assistance from a local nursery or contractor). Succulents: Not only are succulents architecturally interesting, they have compact root structures that make them ideal candidates for a vertical garden. Be sure to use succulent potting mix. Air Plants: Tillandsia, or air plants, actually don’t need dirt at all and can be attached to the wall directly. They will need to be spritzed or washed with water, however. Roots of air plants attach the plant to its growing medium, but nutrients are absorbed from the leaves. They love warm weather and can thrive under neglect, but can’t handle full sun. Tropical plants: The idea is to mimic the feeling of walking through an exotic jungle by using bromelaids, grasses and even big-leafed plants like elephant ears to cover an entire wall space. Herbs and vegetables: For those who live in apartments or homes with small yards, vertical gardens enable cooks to grow their own food. A popular indoor application is the vertical kitchen herb garden in lieu of photos on the wall. An ecosystem: Visionaries plan vertical gardens as a self-sustaining ecosystem that includes soil microorganisms that remove toxins while fertilizing the soil or incorporate aquatic animals like fish, mollusks or amphibians to eat algae. A mixture of plants that remove toxins (some are expert at removing specific toxins while others are not) complete the vertical garden and make it a true living wall. 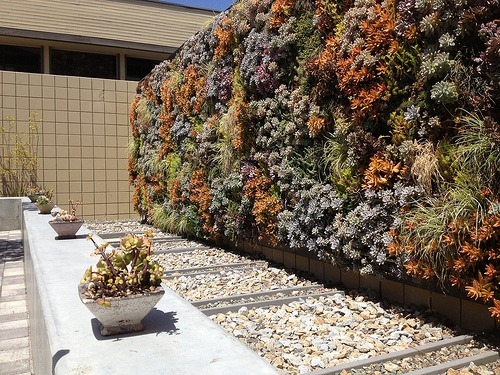 Vertical walls, even ones containing low-maintenance succulents, can’t be planted and neglected. The truth is that they do require diligent monitoring. Wall owners will need to water properly, trim off dead foliage, check for pests and diseases, replace dead plants, clean pumps (if applicable), apply fertilizer and make sure the overall system is functioning properly. Experts believe vertical wall owners initially don’t understand the amount of maintenance involved. 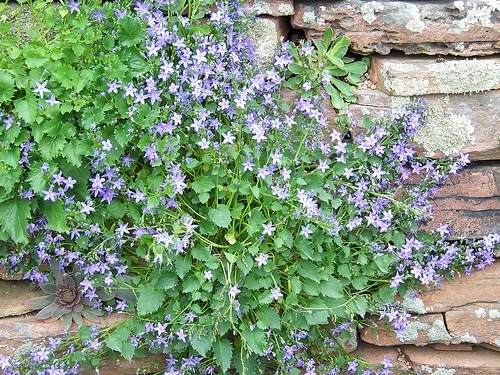 Have you planted a vertical wall or are you considering one?